I finally started going through the images from my final trip to Point Reyes National Seashore before moving to Massachusetts. On many occasions I had glanced at the folder in Lightroom, but couldn't bring myself to seriously go through my last set of new images from my favorite place in the world until yesterday. My wife accompanied me for my last trip to Point Reyes two days before we left California, and we decided to start with a hike along the Tomales Point Trail with the hope of photographing some rutting tule elk. As you can see, the day greeted us with the characteristic fog of Point Reyes, and really, no weather could have been more appropriate! That park taught me to love the fog, and especially the quiet solitude that it brings, and I spent so many mornings walking this trail hoping that the fog would lift just enough for photographs. This was my favorite shot from the day, since there is a fair amount of emotion to the pose of the bull elk -- much like we were at the time, he was sensing the wind and deciding which direction to go (of course, his decision was based simply on the availability of female elk). Otherwise, I didn't get too many images that I was very happy with from this trip. We spent a fair amount of time watching a large bull guard his harem, and were able to listen to him bugle at many rival males in the area, but the images lacked the clarity that I favor due to the amount of moisture in the air. No regrets though -- Point Reyes gave me more than my fair share of favorite photographs over the years, it was wonderful to spend one last morning in the park with my wife. Even though I'm not sure when I'll make it back, I am already looking forward to greeting the sunrise (or a thick layer of fog) the next time I'm able to be in Point Reyes! 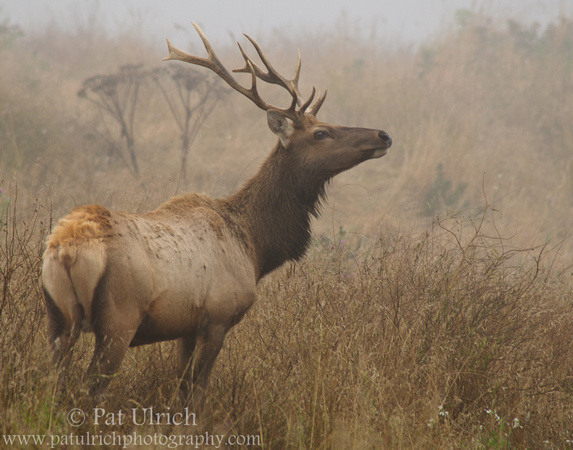 The tule elk in Point Reyes National Seashore are fantastic photographic subjects and you can view more in my Tule Elk Gallery. Such a beautiful capture ... almost like a painting! wow! fabulous shot! i love those beautiful creatures. and a very touching post! I love this photo of the bull elk. Having done my fair share of moving in my life, I understand how emotional it can be. That's one great thing about photography - it helps capture those memories of past times and places. Welcome to the Northeast! It'll probably be a big adjustment, but it has it's own share of beauty. Pat, beyond the spirit and mood evoked by this photograph, your post really struck a chord. My husband and I are now slightly north and away from the Bay Area, and we miss terribly, this magical spot on earth. I also learnt the basic photography rules from Mr. Kishore Mamillapalli who is one of the leading wildlife photographers from South Africa. He used to say that “Beauty truly is in the eye of the beholder”. If you like what you see on your camera screen, or through the viewfinder, you will like the photograph. There are some basic photography rules for composition. Once you know these rules, you can use them, ignore them, or break them. Follow your gut, and you will end up with spectacular, sometimes breathtaking results. Kishore is really an astonishing wild life photographer and has a great eye for details..
Can see why you chose this image. Great shot. Certainly conveys the atmosphere of the morning. Blue Skies.